GREAT BARRINGTON — This quiet Berkshire town is used to the ebb and flow of seasonal visitors. Memorial Day weekend — when vacation-home owners tend to arrive in town to dust off the cobwebs and open the windows — is always a big deal. Independence Day and Labor Day weekends are bigger. For the past five years, a new event has proven perhaps the biggest (unofficial) holiday of them all: the Berkshire International Film Festival. Each year, it not only floods the area with a palpable energy, but exhibits a prescient knack for offering great independent films that end up going on to find a wider audience. When it comes to documentaries, in particular, anyone looking to lay long odds on the next year’s Oscar nominees would do well to scan the BIFF schedule for likely candidates. The sixth annual incarnation opens Thursday with a screening of “Page One: Inside the New York Times’’ at Great Barrington’s Mahaiwe Performing Arts Center. Then festival fever takes over that town’s Triplex Cinema and Pittsfield’s Beacon Cinema, with 70 films showing through Sunday night. 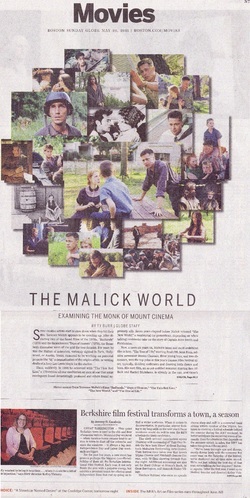 Additional screenings are also set for Bard College at Simon’s Rock, in Great Barrington, and Hancock Shaker Village. Matthew Rubiner, who owns an upscale cheese shop and café in a converted bank sitting within eyeshot of the Triplex, has taken to stocking a festival schedule behind the counter during the BIFF weekend, to better anticipate the oncoming waves of humanity. Even for a business that depends on the summer uptick in sales, the BIFF has taken things to a different level. Unsolicited smooches notwithstanding, it’s obvious this festival transforms the community for a few days. Even as a scrappy upstart, the BIFF felt like anything but. From its first year, the festival oozed a posh sense of style — from its glossy program to the swank afterparties dotting the suddenly swinging downtown. Since then it has grown steadily, from 40 films in two venues to 70 spread across five. Fewer than a thousand tickets were sold in ’06, and more than 3,000 were snapped up last year. Fans have come to expect a high level of quality: the limited allotment of all-you-can-see movie passes reliably sells out about a month before the schedule is even announced. In a region already stocked with well-established cultural options, who would have thought there was room for a major new entrant to emerge? Vickery tracks the industry closely to devise the festival schedule. Her annual January visit to Sundance provides crucial research; this year’s BIFF features more than a dozen films that debuted there, she says, but won’t receive general release until later in the year. Vickery’s homework is supplemented by that of volunteer Lillian Lennox, who keeps a close eye on international festivals to be sure promising work screening in Berlin or Edinburgh or Australia isn’t overlooked. In its first five years, the BIFF has screened no fewer than five films that went on to snag Oscar nods for best documentary feature. In 2008, “Man on Wire’’ opened the festival before earning that Academy Award, and actress Melissa Leo was on hand with screenwriter Courtney Hunt to present closing-night film “Frozen River,’’ well before anyone could predict they would each capture Oscar nominations. Entrants from the last two festivals going on to similar success included socially conscious documentaries “Food, Inc.’’ and “Waste Land,’’ satiric feature “In the Loop,’’ and the painfully forthright “Joan Rivers: A Piece of Work,’’ which didn’t figure in the Oscar race but became a hit. One of this year’s documentaries with a good chance of emerging from indie obscurity is “Chasing Madoff,’’ the first feature by director Jeff Prosserman. It closes this year’s BIFF with a New England premiere on Sunday. The story of Harry Markopolos, the portfolio manager at Boston’s Rampart Investment Management Co. who spent nine years attempting to blow the whistle on Madoff to a seemingly uninterested Securities and Exchange Commission, the film was inspired by the conspicuous anger Prosserman recalls observing in New York after the Madoff scandal broke. “You saw the lines of outraged people on the street, going from working at a hedge fund one day to working at Starbucks, screaming into their phones,’’ he recalls. Special effects guru Douglas Trumbull, who did groundbreaking work on films including “2001: A Space Odyssey’’ and “Blade Runner,’’ will be honored Saturday, followed by the latest BIFF coup: a screening of Terrence Malick’s “The Tree of Life,’’ for which Trumbull supervised the effects. It was secured at the last-minute after winning the Palme d’Or at Cannes just a week and a half before the BIFF. Other potential highlights include “Buck,’’ opening the Pittsfield portion of the festival on Friday with the true story of horse whisperer Buck Brannaman; “Monga,’’ a Taiwanese feature about young gang members screening on Saturday; and “Living for 32,’’ a documentary short about a survivor of the 2007 Virginia Tech shootings, included in one of five shorts programs screening over the weekend. Pre-festival analyses aside, the joy of any film festival comes with unexpected discovery. “This year is without a doubt the best programming we’ve ever had,’’ promises Lennox — not an unusual claim for a festival organizer, but the folks behind the BIFF have a track record that makes hyperbole unnecessary. For schedule and ticketing information go to www.biffma.com.